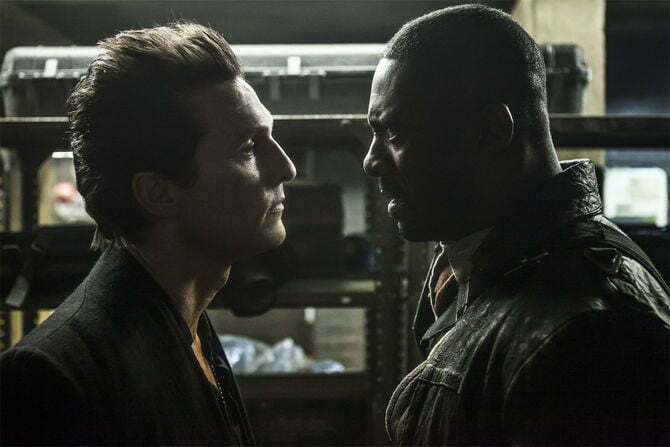 It has been a long time coming, but The Dark Tower movie is finally on its way. The road to bringing Stephen King’s acclaimed saga to the big screen has been nearly as arduous as the journey undertaken by its protagonist, Roland Deschain, across the course of the series’ eight novels, as well as all of the additional prequels and spinoff stories. Plans for a Dark Tower adaptation date all the way back to 2007, with the project gaining momentum and losing it at various points — and with various studios — before cameras finally began rolling more than nine years on. Scheduled to hit theaters August 4, 2017, the film will feature Luther star Idris Elba as Roland Deschain, Dallas Buyers Club star Matthew McConaughey as the Man in Black, and Doctor Foster actor Tom Taylor as the teenager Jake Chambers. A Royal Affair filmmaker Nikolaj Arcel will direct the movie from a script penned by Arcel, Anders Thomas Jensen, and Akiva Goldsman. The film is also expected to be accompanied by a companion series on television that will expand on the story brought to the big screen. We compiled all the twists and turns of the project right here and will add updates all the way up to (and likely beyond) the film’s debut. Just a day before The Dark Tower hits theaters, some news regarding the small-screen spinoff of the film found its way online. According to The Hollywood Reporter, The Walking Dead and The Shield executive producer Glen Mazzara will serve as the showrunner on the planned television series based on The Dark Tower, which will serve as both a prequel and spinoff from the film. The series is envisioned as an origin story of sorts for Elba’s character, the gunslinger Roland Deschain, and Elba — along with several other cast members from the movie — will appear in the series to frame the events of the show. Since the show will chronicle Roland’s early years, a younger actor will play the future gunslinger. The series is expected to draw heavily from some of King’s books that explore those early years. The plan for the series reportedly involves 10 to 13 episodes for the first season of the series, with a target premiere sometime in 2018. The Dark Tower director Nikolaj Arcel and his co-writer Anders Thomas Jensen will pen the series. Along with being a story about one man’s quest to thwart an evil entity bent on bringing destruction to myriad worlds, The Dark Tower also serves as connective tissue for many of author Stephen King’s most famous novels. That’s made readily apparent in a new teaser for the film that runs through some of the many references to King’s other stories that can be found in The Dark Tower. Among the call-outs to King’s other works that you can glimpse in the new teaser are a photo of the Overlook Hotel from The Shining, the poster of Rita Hayworth from Rita Hayworth and Shawshank Redemption, a St. Bernard and “Attack Dog” sign referencing Cujo, and a toy 1958 Plymouth Fury like the one in Christine. There’s also a drawing of a smiling face glimpsed on a wall, much like the signature of the killer in Mr. Mercedes, and a copy of the book Misery’s Child from King’s Misery, and the scrawled number “14-08” over a ragged doorway, referencing the 1999 short story 1408. Those are just a few of references found in the teaser, with more likely to be found in the film itself. Just a month before The Dark Tower‘s premiere in theaters, a new international trailer for the film debuted online with some additional footage from the film. Along with providing a glimpse of Mid-World, the realm inhabited by gunslinger Roland Deschain (Idris Elba), the trailer also offers more footage of Roland and The Man in Black (Matthew McConaughey) battling in a world not too different from our own. Sony Pictures released a new promotional video for The Dark Tower in June 2017 that puts the spotlight on actor Idris Elba’s character, the last of Mid-World’s legendary gunslingers. The video features commentary from Elba, as well as his co-star, Matthew McConaughey, who plays the evil entity known as The Man in Black. The creator of The Dark Tower series, novelist Stephen King, also offers some thoughts on both Elba’s character, Roland Deschain, and the weight of the legacy he carries to defend the nexus of worlds located within the titular tower. After nearly a decade of build-up and uncertainty as to whether we’d ever really see a movie based on King’s beloved saga, the first official trailer for The Dark Tower was finally released on May 3, 2017. Along with giving fans their first look at the tone and feel of Arcel’s adaptation, the trailer also offered a sneak peek at Elba and McConaughey as the story’s powerful opposing forces in an adventure that spans multiple worlds, and Taylor as the young man who plays a pivotal role in their ambitions. Just when it seemed like The Dark Tower was finally locked in and on its way to the screen, The Man in Black — or rather, the studio scheduling strategy — struck again. Despite releasing a new poster just a week earlier touting a July 2017 release date for the film, Columbia Pictures in late March moved The Dark Tower back a week, setting the long-awaited movie’s new premiere date for August 4, 2017. At this point, fans have already waited nearly a decade for King’s story to make it to the screen, so what’s another week? The scheduling shift is the latest in a long line of unexpected moves involving the film, which has transitioned in and out of development limbo over the course of its long, troubled evolution. No reason was given for the change. After several months of relative quiet regarding The Dark Tower, Stephen King surprised fans with a new poster for the film in March 2017 featuring the core trio of cast members amid a kaleidoscopic city skyline. Posted on Twitter, the image was accompanied by a caption from King that recalled familiar themes in the novels. “Pilgrim, there are other worlds than these. Come with us on the adventure,” King wrote. It has taken almost 10 years to get The Dark Tower movie into theaters, so what’s a few extra months? In early November 2016, Entertainment Weekly reported that the film would not be released in February 2017 — the premiere date the film had carried for almost a year — and would instead be pushed back to a potential summer release date. The report indicated the project will need more time for its post-production visual effects to be completed, while also allowing more time for the film to be promoted. The need to take more time producing the film’s visual effects stems from the project’s relatively low, $60 million budget, according to the report. It didn’t take long for fans to find out when they can expect to see the film now, though, as The Dark Tower was subsequently given a new release date: July 28, 2017. That release date was later changed to August 4, 2017.